Is your Chandler’s home flooring outdated and ugly? If you are unsure of what type of flooring to use or do not think you can afford to replace your outdated flooring, think again! Indoor stained concrete floors are a low cost, wallet-friendly solution that will give you an updated look for your home. Professional concrete coatings is not only super affordable, it is the most durable flooring option that will provide longevity and requires hardly any maintenance. Update your kitchen floors, living room, bathroom and more on a low budget with stained concrete. Barefoot Surfaces provides Chandler and the surrounding area with professional concrete coatings making it easy to remodel your home on a small budget. Concrete flooring is not only a great solution for homeowner’s looking to update the interior and exterior of their home. Stained concrete flooring works well for businesses too. Restaurants, retail stores, professional office spaces, work shops, storage centers and many other buildings benefit from professional concrete coatings. Barefoot Surfaces has updated flooring for many different structures besides just homes. Stained concrete looks great anywhere! Check out our image gallery to see the many different finishes we can do to update your home or business. Customer satisfaction is our main goal at Barefoot Surfaces. We want to ensure each and every person who hires us is happy with the results of their new floors. The owner, Ric Ramirez takes pride in his work and listens closely to his customer’s needs while providing expert recommendations to achieve their desired results. Ric and his crew of professionals go above and beyond for every client, keeping them informed during the entire process of the flooring project. Barefoot Surfaces is the most knowledgeable stained concrete service in Chandler and is licensed and bonded. Don’t hire an amateur, call a professional. We have over 20 years of experience with concrete floor coating. You will not be disappointed with our company and you will absolutely love how your new concrete flooring looks. It is a smart investment you will not regret! Replacing the flooring inside your home does not have to be stressful. If you need a complete flooring makeover you can save time and money by updating your whole house with just one flooring option: concrete. Rather than switching out old carpet with new carpet in bedrooms, hallways and living rooms and then putting in new tile or wood in kitchens and bathrooms, you can use concrete coated flooring for everything! Let us be your one-stop shop for your entire home’s flooring solution. Another benefit to concrete is that it is environmentally friendly and hypoallergenic. Homes with carpet have dust mites and household allergens that get stuck inside carpet fibers. So not only is concrete affordable and environmentally conscience, you will have a healthier home. You will be impressed with the low maintenance and durability. 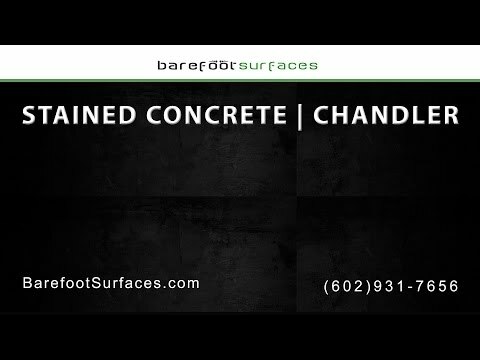 Contact us today to find out more about our Chandler stained concrete services! We can remodel your garage, outdoor patio or pool deck. We provide these additional services as well: garage cabinet storage solutions by Slide-Lok, garage flooring with epoxy coatings, garage flooring with polyaspartic coatings, concrete remodeling, grind and seal. Give us a call today! We would love to discuss the many different services we offer to make your home beautiful inside and out! For all of your concrete flooring needs, call the experts! Ric Ramirez has over 20 years of experience and is a licensed flooring contractor. Not only is he the most knowledgeable flooring contractor, his professionalism and superior customer service is unbeatable. Call him at 602-931-7656 or if you prefer email, send him a message at RicR@barefootsurfaces.com.